Nashua- Lynn E. Randall, 60 years young, passed away unexpectedly Sunday, April 7, 2019 at Southern New Hampshire Medical Center. Lynn, born in Plymouth, NH on December 6, 1958, was the daughter of late William Randall who passed in 1965 and Juanita (Downing) Hall who passed in 2004, both of Wentworth, NH. She moved to Bridgewater, ME as a child when her mother remarried, went to back to Wentworth at 18, married in 1978 and lived in Newbury, VT, then settled in Houlton, ME in 1986 after separation/divorce where she raised her children. With her nurturance and ever-persevering strength, she was proud of her biggest accomplishment: her children becoming wonderful adults; one a forensic psychologist and the other an Army Veteran and brilliant artist. While accompanying her adult daughter’s many migrations, she adapted from rural to urban life, moved around several Greater Boston locations, and finally spent the last several years in Nashua, NH close to both her children again. Lynn, a full time homemaker, was an ever-thoughtful and loving mother, grandmother and best friend. She truly gave her all in these roles. She would also penny-pinch all year just to buy holiday gifts for those closest to her heart. In her free time, she enjoyed listening to music, would rock out to 80’s hair bands, attend concerts, watch horror movies, soap operas, reality tv and was a huge Chriss Angel fan. She had an affinity for unicorns, seafood, chubby babies, kittens and David Cassidy. She also appreciated nature such as the ocean, scenic drives, flowers and bird watching. Most recently she enjoyed making photo albums of loved ones, playing cards, making boards on Pinterest, doing puzzles and thrift shopping. Lynn will forever be remembered for her infectious and boisterous laugh, her ageless beauty and her sweet, giving nature. Above all, her most cherished time was spent with her loving family, especially her grandchildren and grand-dogs. 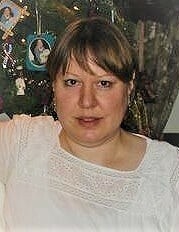 Lynn is survived by her two children: Crystal and Jason Cookman and their respective partners Noel and Jaime of Nashua; and her two grandchildren, Hannah Mayfield and Elliot Cookman. She is also survived by her sister-in-law Marla Randall; nephews Vincent, Cameron and Derek Randall and their wives/children; step-brothers Arlo and Cecil Hall; step-sisters Diane David and Elaine Hall; as well as her extended family to include, but not limited to, Ruth, Brad, Sharon, Elaine, Ronnie, Pam W, Laurie, Pam H, Kelly and Yvonne and their spouses/children; prior mother-in-law Phyllis Vogel, prior in-law siblings Calvin & Vidy Cookman, Craig Cookman, Beth Graham and Joy Clancy and their children. Additional mention: her special friend Jackie, former step-granddaughter Lily and Hannah’s mother Christina. She was predeceased by her siblings, Gary and Joan Randall of Wentworth, NH; stepbrother Charles Hall and his wife Jeannie; stepfather Cecil Hall, stepsister-in-law Gloria Hall, Aunt “Gwen” Guinevere (Downing) Newton, former sister-in-law Linda Randall, cousin Todd Randall; former husband Wade Cookman and the last true love of her life, William “Billy” Ellis. All were close to her heart and alive in her memories, and she is happy to be with them again. Relatives and friends are invited to Lynn’s Memorial Service on SATURDAY, April 27th at 1 PM at ANCTIL-ROCHETTE & SON FUNERAL HOME, 21 Kinsley Street, Nashua. Interment will take place at the convenience of her family, upon further notice. .
Any who wish to donate to charity in honor of Lynn, can send proceeds to their community mental health center, local food pantry or The Salvation Army. She would much appreciate this as a last opportunity to repay their support during her times of need.